Article first published as Interview: Roe De Pinto, Author of ‘The Adventures of Zealy and Whubba: Zealy’s Very First Swim’on Blogcritics. Roe De Pinto grew up in the Bronx and Yonkers, and is mostly Italian, of American descent. Growing up, she was taught the closeness of family and friends were always welcome for family gatherings. The family circle was very important, with all the family gathered together on Sundays, which highlights her memories of growing up. Roe raised her two children with the same values she was taught and tried to instill in them that love is more important than anything in this world. When her children were young she decided to take a 3-year course in children’s literature while raising them. She also got her Realtor’s license in New York and California, and was certified as a notary and a travel agent. She also established her family business office, administrating their fast growing electrical business with her husband, Awni. Roe has always loved her writing, feeling that she always expressed herself better through the written word than verbally. She always loved cartoons and animation and watched them with her children and grandchildren every chance she could. During my literature course, she had an idea for a series involving a baby seal pup and a baby orca. After she finished the course, she shelved the ideas since she was so busy with daily living, prioritizing her family first always, hoping that one day she would pick it all up again and bring her characters to life. Thirty years later, Roe is making her dreams a reality. The Adventures of Zealy and Whubba: A New Life Begins, Book 1 Series 1, took 9 months to deliver. She worked diligently with her illustrator, Robin Gulack, to get the characters to look the way she envisioned them, and a year and a half later, Books 2 and 3 are in print. Roe is self-published right now and would like to work with a traditional publisher for the rest of the series so she can concentrate on her writing rather than the marketing of the books and has already have written up to Book 9 in the series, with 3 more to finalize. Her retirement project is now a dream come true and she is thrilled to accomplish what she has thus far as a legacy to her husband, children, grandchildren and all of her family. Sheri: Welcome Roe, and thank you for being with us today. Why don’t you start by telling our readers a bit about yourself? Roe: My life quite simply was always dedicated to my family. They are and always will be my reason for living. My husband, Awni, my children, Dina and Anthony, and my grandchildren, Lucy, Aurion, and Leo are the center of my universe. My other jobs as a realtor in two states for our private investments, property managing, and huge family business administrating as office manager all came second on my list of priorities. I started Zealy and Whubba many years ago when I took a home course for 3 years from the Institute for Children’s Literature. I shelved the project being too busy to concentrate on it and now for my retirement years, I am finally accomplishing something both for my own self-satisfaction and as a legacy to my entire family. I need to follow my dreams! Sheri: What inspired you to create The Adventures of Zealy and Whubba series? Roe: Countless hours of watching cartoons with my children and now my grandbabies actually inspired me. Just seeing the smiles those cartoons put on their precious little faces and watching them relate to the characters on the TV really made my heart melt from the sense of innocence I witnessed over and over again. I needed to create characters that would do just that – bring smiles to the adorable, precious children in this world, who, to me are God’s greatest gift. I want my characters to act as ambassadors to their small, little world and have them teach the importance of love, caring, sharing, and safety in their environment through their little escapades of daily living, growing up with each passing day. I feel these need to be rooted in them from birth, to establish self-esteem and integrity in every little human being all across the globe. Sheri: Tell us about your latest book – what is Zealy’s Very First Swim all about? 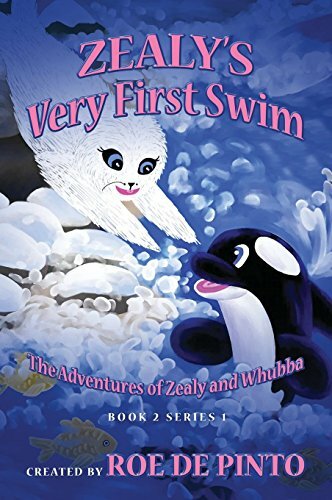 Roe: This book is about Zealy’s very first encounter with swimming, which is an essential skill needed for a seal to survive. The book also teaches by example, the importance of friendship and camaraderie, as the characters interact and grow together learning at the same time to protect one another. Sheri: What is the lesson behind Zealy’s Very First Swim? Roe: Quite simply, the lessons are of survival, safety, loving, and protecting one another. The audience of ages 0- 6 needs a simplistic form of learning, and I feel the story is not complex and easily read, and that age group relates to the characters and the story without them losing interest. Sheri: As a children’s author, how do you think kids connect to actual books in this age of the internet? Roe: I feel children must see, touch, and feel in this age group, and e-books are fine for traveling but children need to be holding and connecting through their senses to really absorb what they are being read and/or what they are reading. Sheri: What guidance can you give to parents on how to instill a love of reading and introduce the world of books to their children? Roe: Parents absolutely must from their very first day with their children, very simply- show and tell! They must read and show them books and spend at least 15 minutes to a half hour a day, with their children reading. Believe me, it pays off because the most important learning ability is to be able to read. My two children were honors and on the Dean’s list from kindergarten through finishing college, and my 5-year-old granddaughter reads like a 4th grader. So it does pay off in the long run. Sheri: What is the best part about being a children’s author? Roe: Creating through the eyes of a child – the child in me. Sheri: What is the best piece of advice you ever received about writing for children? Roe: Write with your heart, not just your mind-share what you feel through your words so that others feel what you are feeling, too. Sheri: What advice can you give aspiring children’s book authors? Roe: Use your imagination and try to create what you think children really see and feel but always keep in perspective, what that child will take away from reading your words. Remember children from very early on mimic everything they see and their minds absorb every detail so always be careful what you are trying to portray to them. Sheri: What’s next for Zealy and Whubba? What plans do you have for the series? Roe: Book 3, Zealy and Whubba Go Fishing should debut by July 2016 and there are nine more in this series to follow. This is the fun and simple learning series, then I would like to develop an educational series with ABC’s, etc. as well as a cartoon series and apps and a retail merchandising line dedicated to my two precious characters. Sheri: Do you have a website where people can find out more about you and The Adventures of Zealy and Whubba? Roe: Yes. They can go to http://outskirtspress.com/zealyandwhubbaveryfirstswim and http://www.amazon.com/Roe-De-Pinto/e/B01707DTKS. Roe: Just to say thank you for your support in making my dreams a reality and watch for the new escapades of Zealy and Whubba to come. Visit your local bookstores and order all three books and watch your precious little ones smile and light up your world! Zealy and Whubba will melt your heart just as they do mine! Sheri: Roe, thank you so much for stopping by today. It has been a pleasure getting to know more about you and Zealy and Whubba! Roe: Oh my, it is my greatest pleasure to share my characters with children all around the world. I pray every household one day will know and grow with Zealy and Whubba! Thank you for the opportunity to share my passion with you all!